Getting married is such a joyous time. Let us be part of your special day. 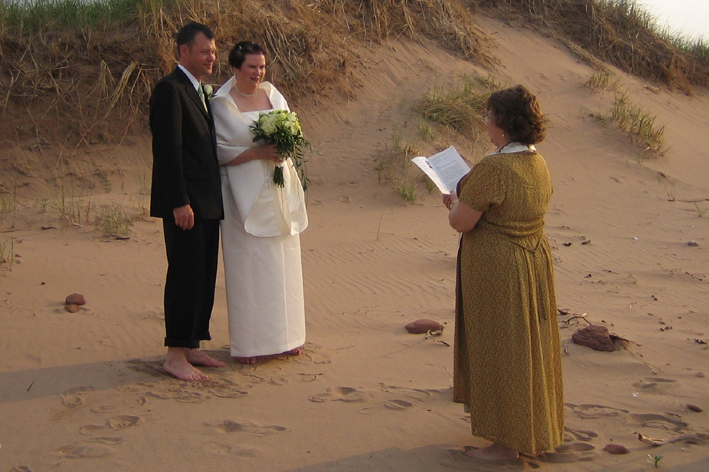 Rev Barry conducts a wedding on Cavendish Beach, PEI . Rev Sandi conducts a quiet, intimate wedding ceremony at Dalvay Beach. Non-Denominational, Interfaith, Spiritual and Civil Ceremonies. Revs. Sandi and Barry King have conducted weddings for couples all over Prince Edward Island for more than 20 years. Their experienced, professional, and calm approach helps ensure that the wedding ceremony and day is relaxed, stress-free, personal and memorable. We are dedicated to helping each couple wishing to marry create a ceremony which is personal, spiritual, meaningful and grounded in their beliefs." "The PEI Interfaith Ministry celebrates all traditions and spiritual paths and believes that two people who wish to dedicate their mutual love and commitment for one another have the right to be married in a spiritual setting in the eyes of the God of their own understanding.” Embracing diversity, Rev. Barry and Rev. Sandi are dedicated to providing spiritual services, for all persons regardless of race, religion or sexual orientation. We will help make your wedding uniquely yours. In addition to wedding elements which would be familiar to most people, couples can chose to incorporate special components which draw on one of the world's many religious traditions or spiritual practices. Unique wedding components can also express meaningful sentiments or allow for family participation in the ceremony. Such elements include the Sand Blending Ceremony, the Celtic Hand-Fasting, the Rose Exchange, Wine Ceremony, Tea Ceremony, or others.